While it’s only a legal requirement to wear a helmet when riding a motorbike, if you come off, the coarse road surface will act like a cheese grater on your skin and you’ll be left with serious (and often disfiguring) injuries that could cause you the long-term pain and inconvenience of multiple surgeries like skin grafts. If you’ve ever tripped over and grazed your knee on the pavement now imagine it at open road speeds. Personal protective equipment (PPE) is equipment designed to prevent this. But it also provides other functions: it improves your visibility and protects against the weather. Personal protective equipment covers your whole body – this is the best way to avoid or minimise your injuries in a crash. If you haven’t already got a helmet, visit our helmet buyer’s guide here first (opens in a new window). Let’s start from the boots and work our way up. You have to control the rear brake and gears with your foot, and also balance on the foot pegs so it’s important that the boots you choose allow you to do this. It should have arch support in the sole and the sole needs to be grippy and preferably contain some kind of anti-crush reinforcement like a steel shank. Properly protective boots should cover your ankle and come with shin protection. Shin protection will reduce the chance of you breaking your tibia or fibula if you have an accident where you go over your handlebars because a rider’s legs often hit the bars in these cases. Ankle protection will help prevent your ankles from being hyperextended, particularly if you end up under the bike in an accident. The best protection is with solid ankles, but these types of boots are more difficult to walk in. 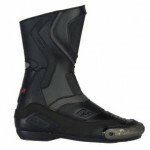 Whether you ride in hot, cold, rainy or dry weather the boots should be waterproof but breathable. You need to be able to take them off and put them on easily and they should be of a fit that doesn’t pinch your feet or cause numbness or tingling. For extra visibility reflective areas on the heel, toe and outside are advised. If you ride long distances choose your socks carefully to give you the most comfort. At the bare minimum, you should invest in a pair of heavy motorbike-safe denims. These are thicker denim with a reinforcing fibre like Cordura, and Kevlar shields at impact areas like the hips that will resist an accident far more effectively than normal jeans. 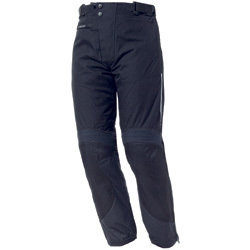 They often have built-in or adjustable knee protection and look like regular jeans. The adjustable knee protection makes it possible to get the best fit, regardless of your leg length. Because they are designed for sitting on a saddle, look for jeans that remove the four-way seam that usually joins in the crotch area. The downside is that they are not as weatherproof as other motorcycle protective pants. Other forms of pants can be more abrasion-resistant with the ultimate choice being proper motorbike leathers. Any pants you choose should have hip protectors. If they come with built-in knee pads then you won’t need to wear other knee pads. 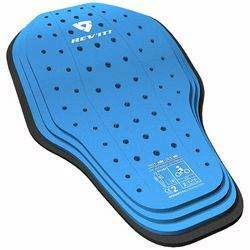 There are all kinds of knee pads in different thicknesses and they can reduce injuries caused by your knee hitting your handlebars or other objects. Some will come with seat padding to make it more comfortable for you on a long ride. The pants need to be able to fit over your boots otherwise when you ride in the rainwater will find its way down into your boots. Reflective material on the piping, stitching and turnups help with visibility. You will need pockets for storage and these should be easy to open while wearing gloves otherwise they will be frustrating for you. Depending on your riding position, your legs might be quite bent, in which case you could choose pants with a longer leg so that they don’t ride up. When you try them on, crouch down and make sure they are comfortable in the crotch area and remain a suitable length. If you need to wear a belt you’ll need a belt with a buckle that doesn’t dig into your stomach when you are riding. Finally, if you want to zip your jacket to your pants for extra back protection and to stop your jacket riding up if you have an accident then you’ll need to make sure that the zips are compatible. A spine protector or kidney belt protects the second most important area of your body after your head: your back. Some jackets already have built-in back armour, but if not then you can purchase separate back protection. It comes in many different shapes and sizes; some will protect most of your spine while others protect just your upper spine. Purchase the absolute best you can afford because it could mean the difference between ending up in a wheelchair or not. You wear it underneath your jacket. If your jacket has a pocket for the protector, buy one that fits the pocket; if not, buy one that has a shoulder harness. Your jacket has risk areas where it can ride up and leave flesh exposed on your back and around your wrists. Leather has traditionally been used for motorbike jackets as it provides excellent durability. There are a large number of modern fabrics, though, which provide better protection and breathability. Many provide built-in armour in the elbows and some provide it in the back, too. Your jacket’s collar should meet your helmet otherwise you will need a scarf or windproof balaclava in colder weather. Cuffs should have some kind of tightening method such as Velcro or extra zips (not just elastic) as this will stop the sleeves riding up and exposing your arms in a crash. 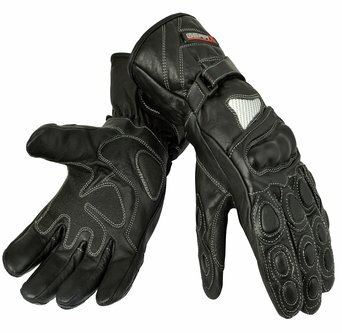 Pockets that are easy to access while you are wearing gloves will make riding more pleasant. Some jackets come with removable liners so that they can be used multi-season. 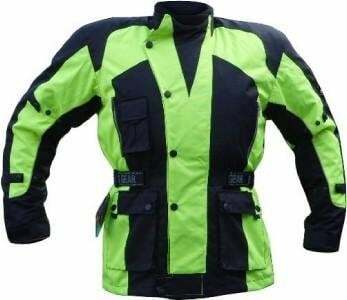 For the best visibility choose a bright-coloured jacket or a jacket with larger reflective panels. Or wear a high-vis vest over the top. Your hands must be kept warm so that you can retain subtle control of your bike’s throttle, brake and clutch. Gloves will provide both weather protection and also protection if you fall off. There should be protection for the knuckles and (optionally) the back of the hand. A wrist strap will ensure that you can tighten them enough so that they don’t come off. They must be breathable or your hands will get sweaty quickly and that will be uncomfortable. There should be enough padding for you and the finger length must be comfortable. They come in various types of fabrics and leathers with the protective elements being in rubber, plastics or Kevlar. Choose a fabric and design that stays clean easily. The gloves should not be unduly slippery when wet. A visor wiper is sometimes included on one of the fingers. Reflective panels will help with visibility. If you’ve got a loud bike then riding it for any length of time could start to cause hearing loss. A set of earplugs will reduce the volume of the bike by between 20-30dB (decibels). You won’t get more reduction than 30dB because sound is also transmitted directly through your head, not just your ear canals. Loud bikes can start to cause permanent hearing damage within an hour of riding. There are several different types of earplugs. Try different varieties to see which ones feel most comfortable for you when you are wearing your helmet. Excessive noise causes fatigue and this will affect your riding. Try a pair of earplugs out – even a pair of $1 foam ones – and see how different you feel at the end of a long ride. But, be careful to pay extra attention for emergency vehicles. While the plugs won’t eliminate the noise of the sirens, you won’t hear them quite as soon. The best type of helmet for protection is a full face one with a visor. However, you might want to ride with your visor up if the weather is hot and traffic is slow. You will then need eye protection. Sunglasses you use for riding should always be shatterproof. Read our guide to wearing glasses while riding here. The serious motorcyclist might want to invest in a one-piece suit similar to those worn by motorbike racers. Sizing is important here. The suit will also be designed to give you maximum control and comfort while you are sitting on your bike, not while you are walking around. If you’re riding in cold weather then you will need warm, breathable base layers. There are specialist one-piece undersuits or you can mix and match with the types of clothes that you would wear as base layers when skiing or snowboarding. A one-piece undersuit can make it much easier to get a set of one-piece leathers off.